Since I missed Diablo earlier this year, Coyote Ridge, with 7,350 feet of climbing, would be the most technically difficult trail run of the year, at least mile-for-mile. The day started off cool and foggy, not so much that you couldn't see very far in front of you, but enough that you couldn't see the hills in the distance. The forecast called for a clear day and 70 F by noon. We'll see what happens. As the race started, a clump of solid runners took off with me. I slid in place behind about six of them. I kept trying to look at their bibs and noticed that most of them were only running the half-marathon. One was running the marathon, and another was doing the 20-miler. None in the 50k. That's a good sign. Once the hills began, I separated myself from all but two of them, both doing the half, and by the time the first round of hills were over, I was well ahead of all but one. Some people were walking the hills already, only a few miles into this thing. I happily trotted up the staircase coming out of Pirate's Cove, and it didn't even feel that hard. Weird! 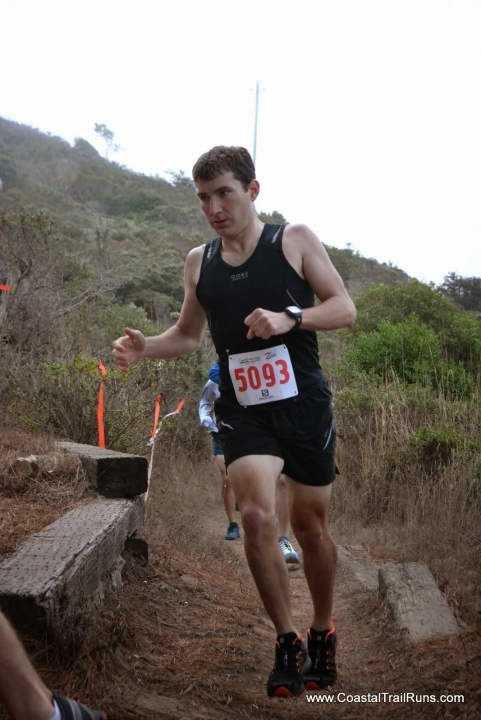 Along the ocean ridge, running on the side of plunging hills, above the Pacific Ocean, it was still foggy. Kind of a shame, because that's one of my favorite views from any course in the Coastal Trail Runs. I love scenic points overlooking water. Maybe it would clear up and I'd get to see it later. Arriving at Tennessee Valley (I feel like I should build a house there), I was still feeling good, and as I climbed the hill leading away from it, as it seems I do every other weekend, I noticed that it didn't seem that bad. Normally, that hill is tough and it takes it out of you, but I was doing great today. I reached the top and bounded down the singletrack path with the view of the Golden Gate Bridge, then ran through the fire road that leads you back down to the valley floor. Probably could've made better time here and there, but 12 miles in, and things still felt easy! Maybe not running much in the last few weeks recharged my legs or something. A 20-miler caught up to me at the 12-mile aid station, then took off before I did. I wound up passing him on the next hill and chatted with him a little bit. Nice guy, and seemed like he was going to finish a good race. Went back down the hill and made it to Tennessee Valley again. I was finally starting to feel tired, 15 miles into the race. But covering 15 miles in two hours, I was on pace to break the course record of 4:16! I knew I wouldn't run the second half as fast as the first, but I had 16 minutes to play with. The record was certainly possible. At least, that's what I thought until I took on the hill leading back to the ocean. Good gravy, what a hill! Only 16 miles into the race, and I had to walk it. Didn't feel too bad; the 20-miler guy, who had now passed me again, was walking it too. By now, the fog was only lingering in the bottoms of a few select valleys. Here and there, I would see a patch of smoke just above the ground off in the distance, and my first thought was that someone was having a barbecue. Outside of those few spots, the sun was bright and shining down on us. Going uphill, it was enough to make you feel hot, but on downhills, the extra wind (and lower effort) cooled you off just as quickly. At the oceanside, though, I was hoping for that stunning view I love so much, and the coast was still completely fogged over. Heading down the hill back to Muir Beach, my legs weren't cooperating. I was having to ride the brakes more often than not, when usually, I'd be able to run through it. I don't know if it was raw leg strength I was missing, or strength in my joints (my ankles were starting to hurt). Or maybe it was just the extra five pounds I was carrying, making it harder to bound over the terrain effortlessly. By the time I hit the turnaround at mile 20, I could tell things weren't going well. My legs had found some strength again, possibly only because the course was flat for the past two miles. I downed a little water and a Clif Shot and headed out again. Slowly, but feeling a little better. I had yet another two miles before I'd have to climb again. The sun had fully come out, and it was getting hot. Only about one minute after I left the aid station, a guy passed me coming the other way. I didn't see a bib on him. Was he doing the 50k too? Or something else? Or was he maybe just going for a run, had heard about the race, and was asking what I was doing? I hoped it was anything but the 50k. Seven minutes elapsed before I saw anyone with a 50k bib, meaning I was 14 minutes ahead. With only 10 miles to go, that should be an insurmountable lead. This time, I wasn't able to run up the staircase leading out of Pirate's Cove, so I walked the whole thing. I was sweating bullets. I started to wonder if I should've worn something other than black. But considering that my black shirt is my lightest one, maybe it would've only come out even. On the way down the other side of the hill, the same guy that I wondered was in the 50k passed me. OK, so now it's obvious he's running the 50k. No other distance in this race does this part of the course, and the odds that some random jogger would be following exactly the same course I am are virtually nil. So I just got passed. I'm in second place. However, when the course flattened out for a mile or so before the aid station, I was able to keep him in my sights. He was only maybe a minute ahead of me. I reached the aid station, but spent too much time there. Wasn't feeling well though. I was at the point that everything felt like an uphill. There were still two major hills to go, one of them starting immediately. Reluctantly, I headed up. I wound up walking a couple sections of the hill, even though I knew I didn't need to. At the top, I even stopped in place and looked around. A great view, and peaceful. And my legs hurt like hell, so I wanted to give them a break. I finally started back down, but couldn't maintain a good pace. On the way, I saw the guy in second place, probably about 10 minutes behind me. Once again, I spent too long at the aid station, and took in about 10 dixie cups of sports drink while I was there. I might've been starting to get dehydrated, and probably should've taken more water throughout the race. I finally left to take on the last, and hardest, hill of the course. I walked at least half of it, then barely managed to get going on the downhill afterwards. A cyclist saw me, and probably noticed I wasn't doing so well. "Shade?" He laughed, "I mean, I got some extra water if you need..."
"I'm good on water, all I need is shade and a nap!" He smiled and took off. Not much later, the second-place guy passed me on the downhill. We exchanged a few pleasantries. I tried looking on the bright side of things, even pointing out to him that the fog had fully dissipated, and we were being treated to a gorgeous view of the ocean. "That's what I live for!" was his response. By the time the course had flattened out again, I no longer had him in my sights. No big deal. I let him take it and just focused on finishing the last two miles without incident. In a little too much time, I was there. Third place. This race was an unfortunate combination of a tough course along with me being kind of out-of-shape after spending the last three weeks not training much and eating a poor diet. In that time, I managed to gain five pounds, which on me, is a LOT. I've had worse races, but not many. This certainly wasn't my best. I feel like on another day, I would've come in second, and on a much better day, I could've won, or even broken the course record. That still seemed like a possibility halfway through the race, and then I wound up running the second half a full hour slower than the first. Nothing to do but prepare better for the next one, three weeks from now, and a much flatter course. I'll get 'em next time.